Live by the yachts on the water, great coffee nearby, shops, restaurants, bars and Salamanca Market minutes away. 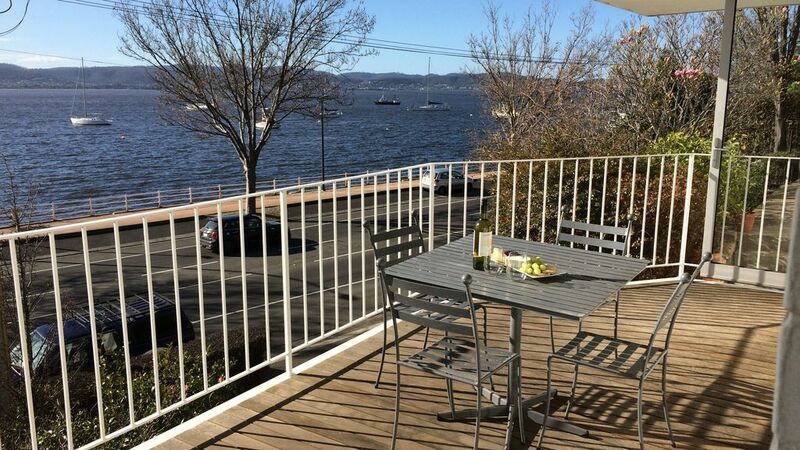 Unbeatable location to take in the perks of Hobart and enjoy the views from the sunny front deck. Mona is just a 25 minute drive away and Wrest Point Casino is over the road. The modern 2016 refurbishment and stunning location will guarantee your stay will be relaxing and perfect. Local buses leave regularly from a bus stop 50m away. The apartment has 2-3 off street parks. We are a family of 5. We live in Hobart and have done most of our lives. Love our water sports and catching up with family and friends. We felt that the location and view would be attractive to travellers. It’s also just over the road from the Casino and it’s facilities. We lived here for six months while we renovated our house and didn’t want to leave. Loved the ever changing view and close proximity of the water. Enjoyed our walks along Sandy Bay Road and local cafes. Catherine was very responsive and accommodating. The place was perfect for our needs. Recommend it to families or small groups. Conveniently located this comfortable and clean accommodation is worth the stay. Everything you need in the kitchen. Beds comfortable with electric blankets and heating throughout. Shower room nice. Would have given 5stars if blind in shower room covered whole window, plantation shutters instead of roller blinds to have flexibility to enjoy views and a current TV. Thanks. By the Bay . I would say it’s got the lot , off street parking, mordern kitchen with dishwasher, modern bathroom big lounge and two good sized bedrooms a balcony overlooking the Derwent even a bus stop out front. Walk to wrest Point . A very neat and convenient place to stay. We enjoyed staying for 5 nights in this two bedroom apartment so close to the centre of Hobart. The view was wonderful and although it is on a main road, the traffic noise did not worry us. The apartment was clean and well presented with everything you need to enjoy your stay. The beds were very comfortable. We loved the lovely garden. Everything you need for a comfortable stay in Hobart. This apartment is in a good location, close to public transport. Parking on site was very convenient for us - although the walk to the apartment may be a bit steep for older guests. Overall, a lovely stay at By The Bay, thank you! Very lovely, modern and clean. The place was lovely, modern and very clean. Great location, very close to town. A little bit of noise from the main road, however the windows cancel a lot of the noise out. We had a great stay there!